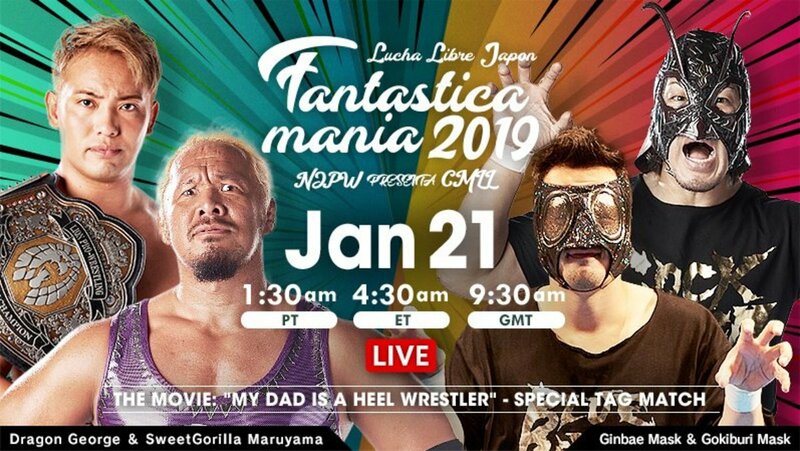 Fantastica Mania 2019 wrapped up today in Tokyo's Korakuen Hall. The undercard featured Atlantis Jr. in singles action, as well as a Mexican National Trios Championship match. The semi-main saw NJPW mainstays Hiroshi Tanahashi, Kazuchika Okada, Togi Makabe, and Ryusuke Taguchi in action, but as their characters from the "My Dad is a Heel Wrestler" film. The main event featured Volador Jr. taking on Caristico in a crazy stunt show. Audaz and Templario kicked things off. Audaz hit an enzuigiri and a springboard crossbody. Cavernario and Flyer jumped in. Flyer hit a headscissors. Templario cut off a double dive, hitting a double lariat, sending Audaz and Flyer to the floor. Templario hit a Sasuke Special, and Cavernario hit a crazy step-up springboard plancha to the floor. Cavernario hit a top rope dropkick, and Audaz flew about six feet in the air taking the bump from it. Templario and Cavernario hit a tandem dropkick/suplex. Cavernario hit a springboard splash for a two count. Flyer hit a springboard headscissors, followed by a quebrada to the floor. Audaz hit a springboard tope con hilo. Audaz and Flyer gained momentum. Audaz hit a quebrada on Templario and made a cover, but Cavernario broke up the pin. Audaz and Flyer hit stereo frankensteiners for a near fall. Cavernario and Templario hit powerbombs. They made covers with their feet on the ropes, but Flyer and Audaz kicked out. Flyer hit a Spanish fly off the top for a near fall. Templario hit a gutwrench powerbomb off the second for a two count. Audaz hit a rana with Templario seated on the top. Cavernario jumped in and cut him off, and used the Cavernaria for the submission. Atlantis Jr. did well for himself until the finish, where he ran into some trouble. He's going to be really good sooner than later. Atlantis Jr. came out hot, hitting a pair of suicide dives. The action spilled into the crowd, where Atlantis Jr. continued his assault. As the match went to the ring, OKUMURA struggled to establish any offense early. Atlantis Jr. used a flying headscissors, and a plancha off the post to the floor. OKUMURA started jawing at the referee, so the ref tried to quick count him off a flying headscissors into a cradle. OKUMURA hit an OKUMURA Special, but Atlantis Jr. came back with a high cross off the top, and a pair of tilt-a-whirl backbreakers. OKUMURA used a powerbomb for a near fall. Atlantis Jr. tried for the Atlantida twice, but he had difficulty locking it on. He got it on his third try, and OKUMURA submitted. The match itself was good, as Naito worked harder than any other night on the tour. The focus here, though, was on the angle at the end of the match, setting up The New Beginning. SHO and YOH entered as themselves, rather than their Fujin and Raijin alter egos. LIJ took their sweet time getting to the ring. LIJ got jumped before the bell. Henare went after Naito, and that's a program that they might go to at some point this year. Hopefully they get some steam behind Henare if that's the case, because he's pretty much been a job guy for the last year. SHO and YOH hit BUSHI and Shingo with dropkicks. Henare and Kojima worked over BUSHI in the ring. Kojima hit BUSHI and Shingo with machine gun chops. Terrible cut Kojima off and slammed him off the top. Shingo and BUSHI went after SHO and YOH on the outside. Naito and Terrible worked over Kojima, hitting tandem dropkicks. Shingo came in and hit Kojima with a senton. Shingo hit a brainbuster for a two count. Terrible hit a top rope slash for a near fall. Kojima hit a Koji cutter, and tagged SHO. SHO and Naito had a nice exchange, ending with SHO dropkicking Naito to the floor. SHO hit BUSHI with a spear. YOH jumped in for the double team, but BUSHI took both out with a dropkick. Shingo hit an elbow drop off the ropes onto YOH for a near fall. Shingo teased the pumping bomber, but YOH countered with a dragon screw. YOH used an enzuigiri and a falcon arrow for a two count. Shingo hit YOH with a huge lariat. Henare and Naito got tags. Henare hit Naito with lariats and a shoulder tackle. Naito sold big for Henare's offense. Henare hit a suplex. Kojima ran in and hit a lariat, and Henare hit a Samoan drop. Terrible ran in, and Kojima nailed him with a lariat. BUSHI jumped in and hit Henare with a sunset flip, allowing Naito to hit him with a dropkick. Shingo hit a pumping bomber, and Naito covered, but Henare kicked out. Taichi, Kanemaru and Desperado ran in and attacked everyone for the no contest. Taichi hit an Air Raid Crash on Naito and posed over him. Kanemaru spit whiskey on Shingo. Taichi got a visual pinfall on Naito. Desperado unmasked BUSHI. Really fun match. All action. Sanson and Titan traded a series of cradles for one counts. They did some more mat work, and exchanged quick covers again. This was different, but good. Atlantis and Forastero entered. Atlantis hit a monkey flip, then a series of hip tosses and backbreakers on all three opponents. Angel entered. He hit a series of moves, but as he mugged in the ring, the rudos took control of his teammates. The rudos went three on one against Atlantis. Atlantis was able to make a tag to Angel, but Angel also got beat down three on one. Titan entered and suffered the same fate. Atlantis came in and made a comeback. Titan hit a tope suicida. Angel hit a Sasuke Special. Atlantis hit a plancha off the post. Titan and Forastero had a nice sequence that ended with Titan making a crucifix cover, and Sanson breaking up the pin. Atlantis used a schoolboy for a near fall. Angel hit a quebrada. Angel used a dropkick on Cuatrero for a near fall. They used a stacked up superplex. Titan used a headscissors. Titan used a fireman's carry in the ring, then hit a dive off the post. Cuatrero hit a spinning sit-out powerbomb on Angel for the pin. ULTIMO GUERRERO, GRAN GUERRERO & NAMAJAGUE DEFEATED DRAGON LEE, MISTICO & SOBERANO JR. This was fun. The work was very solid, and the crowd loved it. Ultimo and Soberano began. They did some crowd work. Ultimo used a Romero Special. Ultimo got a takedown and used an ankle lock. Soberano rolled through and hooked an ankle himself. They rolled to the floor, neither man willing to break the hold. Gran and Mistico entered. Gran offered a handshake, but it was a ploy. Gran unmasked Mistico, but Mistico had a second mask underneath. Mistico hit an arm drag, sending Gran to the floor. Mistico hit a flying headscissors off the post to the floor. Dragon and Namajague came in and had a chop battle. Each hit a knee strike. They traded lariats. Namajague hit a left hand, and Dragon countered with a woo dropkick. Dragon hit another dropkick into the corner, and picked up a near fall. Namajague hit a lariat and cleared the apron, enabling his team to triple up on Dragon, then Mistico, and then Soberano. The babyfaces made a comeback, and all three hit topes over the top to the floor. Ultimo baited Soberano into a facebuster off the top, then a powerbomb off the second. Soberano hit a tornillo, but Namajague broke up the pin. Dragon hit a suicide dive. Mistico hit a quebrada. Ultimo hit a Guerrero Special on Soberano, and got the pin. This was a total cartoon match. I will only answer to SweetGorilla for the rest of the week. Ginbae was Taguchi, Gokiburi was Tanahashi in a cockroach mask, SweetGorilla was Togi Makabe, and Dragon George was Okada. Makabe worked like Makabe. Tanahashi worked nothing like Tanahashi, using heel brawling tactics. Gokiburi used bug spray on Dragon George and SweetGorilla. Ginbae used a fly swatter. Ginbae used a toilet brush. Gokiburi used a plunger and a hammer. Okada hit a dropkick and used a plancha. He teased a top rope elbow. Gokiburi hit a slingblade. Gokiburi jumped into a dropkick. Dragon George went for a Rainmaker, but Gokiburi hit another slingblade. Ginbae hit a back elbow and used a bulldog for a two count. The match broke down into a four-way. SweetGorilla hit a double lariat. Dragon George hit a dropkick and a tombstone, then hit a Rainmaker for the pin on Ginbae. These guys could probably have a good match with each other in their sleep. This was a wild stunt show that served as a nice closer for the tour. They came out fast, both hitting suicide dives. They traded topes, doing long countout teases after. Caristico hit a missile dropkick for a near fall, then hit a springboard crossbody for another. Volador hit a backstabber for a near fall of his own. Volador hit a handspring into a dropkick from Caristico. Caristico went for a moonsault off the top, but Volador got his feet up, and picked up a two count. Volador got launched outside, and Caristico hit a pescado, then hit a crossbody off the post to the floor. Volador countered with a beautiful Asai moonsault. Back in the ring, Caristico hit a 619. He went to the top, and jumped into a powerbomb. Volador picked up a two count. They traded chops and forearms. Volador hit a superkick. Caristico hit a double stomp for a near fall. Caristico hit a handspring back elbow for a near fall. They fought on the ropes, and Volador got crotched. Caristico hit a headscissors from that position for a near fall. They exchanged strikes. Caristico went up top, but Volador connected with an enzuigiri. Volador hit a beautiful super frankensteiner for a near fall. Insanity. Caristico went for La Mistica, but Volador hit a Canadian destroyer and earned a two count. Caristico hit a Canadian destroyer and got a two count. Caristico missed a swanton bomb, and Volador covered for a near fall. Caristico slapped on La Mistica, but Volador was able to roll to the ropes. Volador hit a top rope Spanish Fly, and got the pinfall win.